A finished project for me! OMG SHE MADE SOMETHING FOR HERSELF! I MADE SOMETHING FOR MYSELF! 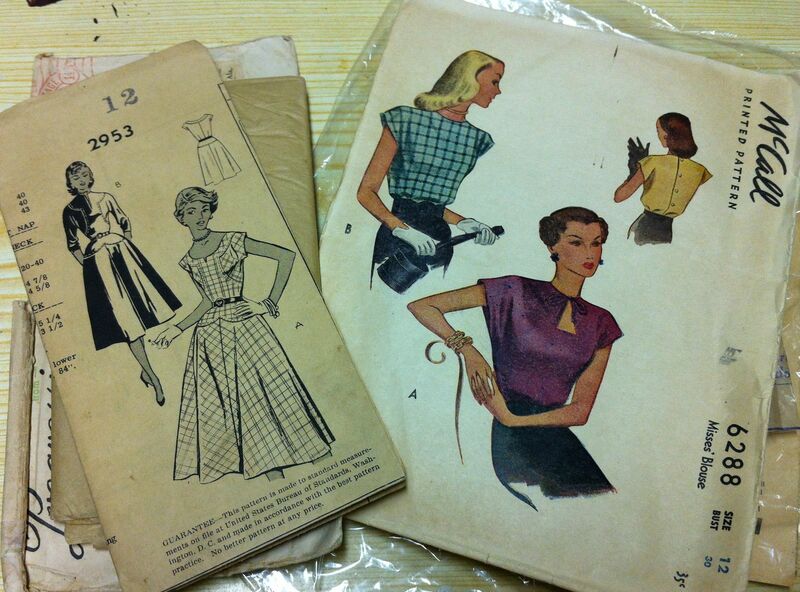 So you may recall that I somewhat wantonly purchased a couple of 50s patterns from New Vintage Lady just before Christmas—a cute dress and a blouse that could’ve been Sencha’s grandmother. Both really adorable, and both a size or two too small. Well, I was feeling experimental on the weekend (and in the mood for something quick that would use up scrap fabric), and somehow in the digging through of fabric and patterns I settled on this combo: Using the McCall’s 6288 (from 1945, the year my father was born) in combination with the scanty fabric remains from my Birthday Dress. Despite the size 12 (30″ bust) of my copy of the pattern (I’m more a 14-16 in the old sizing), pattern-measurement suggested there would be enough ease in the bust and even in the waist, especially if I omitted the little tucks from the waist. So, feeling bold, I traced off the pattern and set to. Careful pattern placement, and a certain amount of fudging, allowed me to fit both sides of the shirt on the .5m or so of actual full-width fabric I had left. I will confess, I did something I have not done, I think, EVER—I fudged the grain-line on the back piece so it would fit. I’m hoping that the fact that it’s a small blouse means the off-grain thing won’t be too noticeable—I certainly don’t notice it, but I’m sure the sewing gods are glaring down in disapproval. 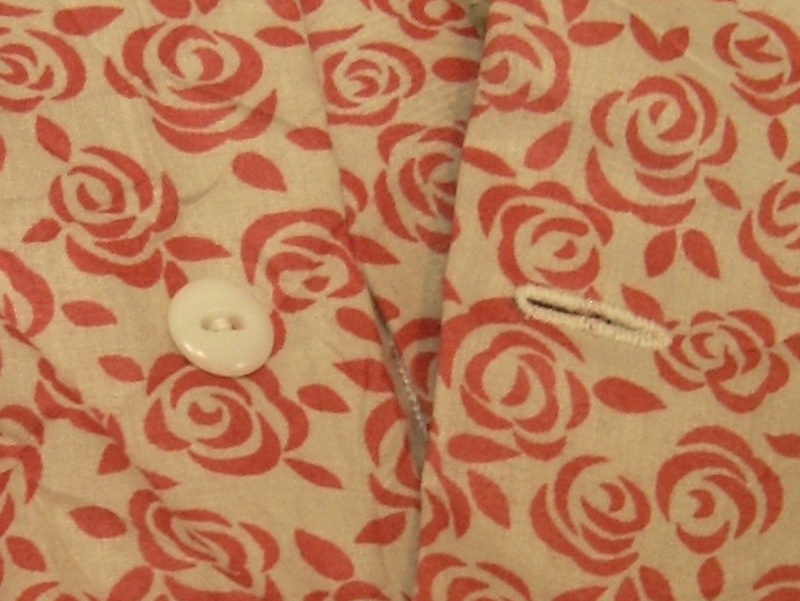 In hindsight, I could’ve pieced the fold-over portion of the rear button placket in from the huge LONG, THIN piece of the leftover fabric, but anyway. What’s done is done. I opted not to be stingy with the interfacing, using it on the neck facings and the rear button placket. Not least because I think it’s a really nice way to finish facings. 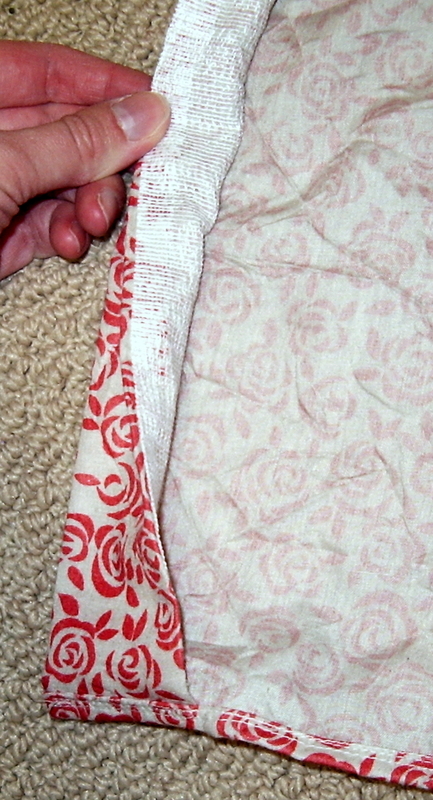 This is the trick that went ’round the blogosphere a while back, where you stitch interfacing and facings right sides together (right side of the interfacing being the non-fusible side) along the outside edge of the facing, and then flip and fuse them. The seam encloses and finishes the facing edge nicely. This is white Armo-weft, by the way, which is far and away my favourite interfacing—lightweight, fuses well, doesn’t shrink or bubble. I mean, there’s probably better out there, but it’s the best I’ve found from what I have available locally. You do need to use a press-cloth, even though I try to pretend you don’t. Anyway, at this point I had to break for the night, and took the instructions upstairs to read over before bedtime. Erm. Me being me, they promptly evaporated, and I was left to wing the rest of the construction. A bit of a bummer since half the interest of making up a *really vintage* pattern like this is checking out the instructions. They have since resurfaced, actually just as I sat down to write this post, on the computer desk where they were hiding under my daughter’s laptop. Grr. So, without benefit of instructions, I set to the next morning, starting with stitching the shoulders (french seam) and then the neck facings into place. I even remembered to stitch the ties in place! Of course, no sooner did I have everything nicely understitched, but I flipped it around and discovered a) my neck-facing was showing on the outside of my back button placket rather than being sandwiched between the two folded layers (leaving an unsightly raw and flapping edge) and b) the neck was WAY too tight. Which, I guess, was a good thing, because it motivated me to fix problem (a) before re-stitching. I lowered the neckline by a good 1.5 cm all around, which has brought it to the point of being just-barely-wearable, although it also means that there’s not much left of my facing. I then decided I would do french seams on the side-seams, which was also not my brightest moment ever, since they don’t play at all well with the way the sleeve is supposed to be finished. It doesn’t really show when wearing, since the fudge is all tucked in the armpit, but it’s definitely not smooth and sleek. You can see it clearly on the interior photo. I made the buttonholes using my Greist buttonholer on the White, since I wanted to try the buttonholer on a machine with drop-able feed dogs. 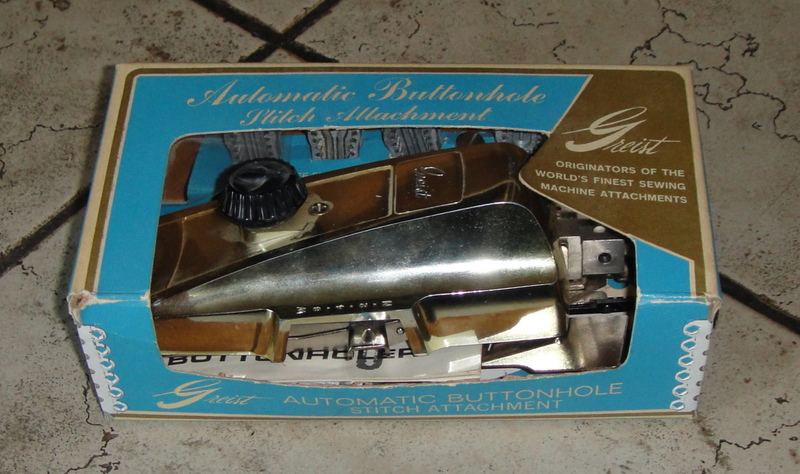 I must admit I feel a bit daft using a buttonholer on a zig-zag machine, but anyway. The White is really growing on me as a machine—I wasn’t initially thrilled, but it’s a sturdy workhorse. It took a few samples to get the tension and stitch-width right, but once I had that figured out it made my buttonholes quickly and fairly neatly. It’s the first time I’ve used the buttonholer on such a light-weight material, and it made for a rather different experience. They’re not all perfect, especially the fifth one which I added after and of course messed up, but they’re in and functional. Incidentally, the pattern calls for four buttonholes; the location of the fifth, now that I have the instructions in front of me, calls for a snap, presumably because that would be more comfortable than a button under a waistband. 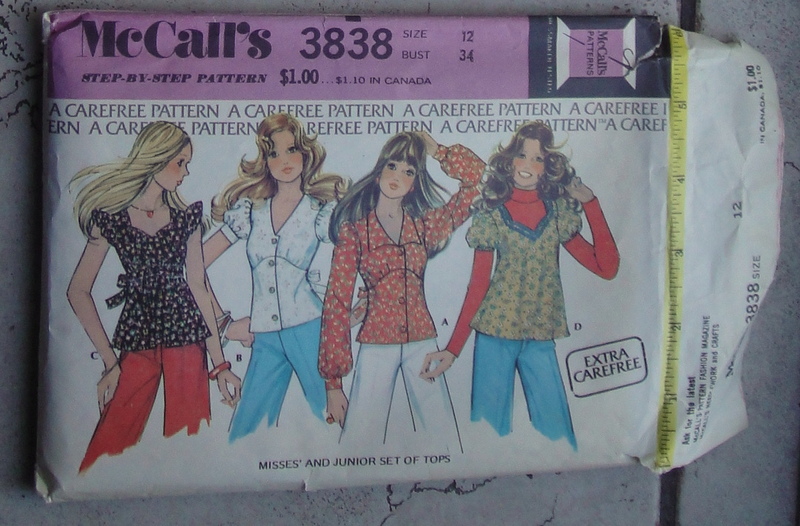 The pattern also calls for small shoulder-pads. I don’t really mind skipping those. I think I look about as square-shouldered as the envelope girls without them, thanks. Well, it fits remarkably well. The bust is a wee bit tight (especially over a padded bra) but not as bad as I had feared—a pinch test suggests there’s just under 2″ of ease, which is pretty minimal for the bust. The waist fits well, although it would be more interesting with the tucks. The darts are a smidgeon high (like maybe 1 cm) but really not bad at all. I really wasn’t sold when I first tried it on, but after throwing it together with over half my wardrobe in a shotgun approach to styling, I think it’s growing on me. I really like it with the shrug, I think because I like the brighter colour contrast near my face. The mix of colours in the blouse kinda blends into my skin tone from a distance. I also think it might be great in a more drapy fabric—crepe or rayon or (ulp) silk. For most of my wardrobe needs it’s also a bit short. You’ll notice one way you don’t see it styled here—tucked in. I tried, honestly—with my circle skirts and my Kasia skirt. It almost worked with the Kasia, but the colours are wrong. And, well. Blouses. I have Blouse Issues. So, all in all, it was a fun experiment. Will I wear it? I’m not convinced—but I’m not quite as skeptical as I was a few days ago, so there may be hope. Especially with my cream capris and the vintage shrug. This is not, obviously, the Bird on a Wire fabric. 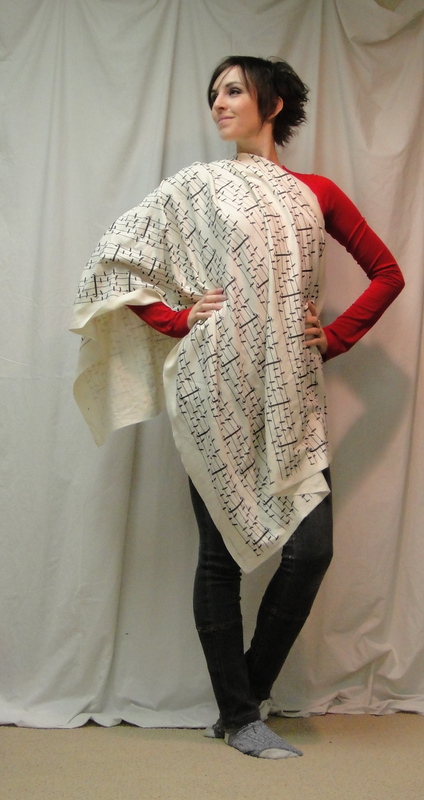 Seeing as Spoonflower knits are like $27/m, I figured a wearable muslin was in order. This stripey stuff (formerly seen in the Where’s Waldo shirt) was like $3/m. That works. I made only one change to Steph’s pattern (which I have to admit, after the Zoe coat fitting and the hack ‘n slash I’ve been doing on the Lekala pattern for my husband, was a BIG relief): I added a crapload of length to the bottom. Steph drafted for 3″ below the waist… 3″ below my waist is still an inch or two above my pants. Those of you who don’t wear your pants indecently low won’t have this issue. 😉 I also smoothed the curve of the back piece in the hip region—I have no idea if it’s better this way, I just liked the look. So, fit? The shoulders fit. Perfectly. Like a dream. OMG. For the record, I did not once supply Steph with my shoulder measurement. In fact, the fit of the whole thing is pretty fabulous. As promised, it’s snug through the bust with a teensy bit of ease in the midriff, just enough to not feel like a stuffed sausage, without feeling odd about the difference between the bust-ease and the waist-ease. Now, just for the record, I made the 35|| size, that’s 35″ bust, rectangular shape. Steph recommends it for those with 8″ or less difference between bust and waist. Also for the record, I myself have a 33″ bust and a 5″ difference with my waist on a good day. /sigh. This is not a very stretchy fabric, but if you’re an actual 35″-bust you probably want to make sure you use a fabric with at least a modest amount of give. There’s a fairly significant amount of negative ease at the bust, which is actually the narrowest point on the pattern. Bonus for me, it meant I didn’t need to adjust the waist shaping for my short waist! I think the only thing I’ll change next time is lowering the neck-scoop a little more. Like an inch or two. It’s a bit high for my taste, and maybe a bit higher than in the version Steph drafted for herself. My neck-binding is standing up a bit, but I think that has everything to do with the fabric not stretching enough to make a nice, flat binding. All inall? Good job, Steph! And thank you :). Should you for some reason require more random photos of me goofing around in a stripey T-shirt, they can be found here. I tried to embed the slideshow, but WordPress does not seem to want to play nice with Picasa. ETA: The pattern is, of course, the Bird on a Wire Tee by Steph of 3 Hours Past the Edge of the World. I’ve linked it before but obviously I should include it in the main post here! Expectation, I suppose, is the problem. I started today with great expectations. The hubs was working (poor him) so all I had to do was get the house recovered from its weekday-chaos state and then I could sew. The kids had friends over all day, which contributes somewhat to the chaos but a lot more to the “me being left alone”, so everything was great. I had cut and started sewing up the muslin for hubs’ frock/Matrix coat yesterday, so I finished that up pretty quickly. And then, I was at a loss. 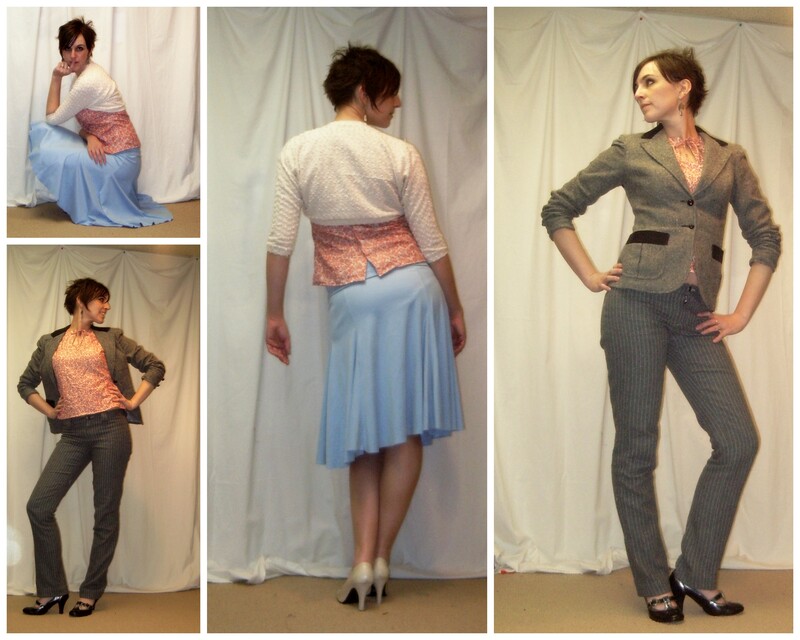 I tend to sew with a bit of a one-track mind—start project, finish project, next project. I don’t multitask well at the best of times. And usually this works fairly well. But my brain was oozing COAT, and I couldn’t do any more on the coat until hubs came home and deigned to try it on—which could take days. Fingers twitching, I moved to another project occupying the sewing table, a shirred-bodice dress for Syo using up the last of the fabric from my niece’s Mini-Minnie dress. A little more mindless than I was looking for, but not as exhausting as pulling out, say, a blazer pattern and starting a muslin for me. Enjoy this picture. This is as good as it gets. Unfortunately, it was finished in fairly short order. Flailing, I pulled out fabrics and put them down. Dug through the scrap bin. Hunted for elastics, considering making undies. Eventually pulled out my knit-tee sloper and started to mess around. I’d like to make a cowl-dress like Oona’s. I even have some gorgous red jersey. Oona used Ichigogirl’s cowl-dress pattern, which I’ve made before as a shirt and found a bit too deep-necked for me. I wanted something with a wider, shallower drape. So I traced out my sloper and played around with slashing and spreading. I am thinking that slashing and spreading is a REALLY BAD method of getting a cowl that drapes the way you want. I would be better off draping the cowl part on the dummy and somehow merging that with my sloper. Or something. Because I keep coming up with some pretty “meh” cowls… and when I do knock it out of the ballpark, it’s pretty darn accidental. It’s not awful, but it’s not quite what I was going for, either. Determined to salvage something from this particular fabric, I pulled out the raglan-sleeve top. Boring, but dependable, and despite the insanely good weather (high of 29C today!!!!) I will be wanting long sleeves very much, very soon. In this fabric, there was plenty of stretch to experiment with bust-gathering. I think it will be OK after I take a couple of inches off each side. This is the same pattern a the Where’s Waldo shirt, of course, but that fabric had very little stretch, while this stuff grows while you look at it. I guess three pretty-much-finished objects is pretty good for one day (even if they’re all ridiculously simple pieces). I guess I was expecting to have something I was excited about, though. In between unpicking the skirt from the halter sundress and procrastinating, I did actually (almost) finish one rather small piece. You may (or may not) recall a large piece (several metres) of starched white cotton I found at the thrift store back in June. It was the kind of lovely, plain, basic fabric you rarely find at the thrift store, so I would’ve picked it up just for that, but one end had also been worked with the most amazing panel of handmade lace I’ve ever seen. Now, admittedly I don’t know much about lace-making. I have no idea what techniques are employed, except that it looks to have been done by hand, with gorgeous patience and precision. I assume this is some kind of heirloom stitching taken to an astounding extreme. It’s one of those pieces that makes you wonder about the person who had the fabric before you, though. What kind of piece was this worked for? Was it meant to be the yoke of a shirt? Part of a Christening gown or something? Why would someone put all that work into making the lace, and then never make the final garment? (The shape and positioning on the fabric suggests garment to me, but I suppose I don’t really know even that). Anyway, obviously it needed to become something that would showcase the beautiful lace. After some hemming and hawing, I made my decision, and cut out a second version of my sundress bodice, with the lace in the centre front panel. I toyed with the idea of putting a coloured fabric behind, to show through at the lace, but the white cotton was too sheer to hide it, so I just lined with another layer of the same fabric. The top. Unfortunately this was the only shot where the light didn't totally wash out the lace. It still needs straps. I had some cut out and pressed and ready to go, but somewhere between bringing it upstairs to do the handstitching I mislaid them. It actually stays up remarkably well, with that large shirred back, but I’ll feel much happier with straps anyway. I used the facing piece to make the little “collar” top, which I really love, although since I forgot to add a seam-allowance to the CF, it wound up not reaching quite to the side-seams. I hand-stitched the bottom of the bodice front together for a nice finish that doesn’t show on the front. I maybe should’ve put some interfacing strips along the V-point in the front, as it’s a bit wavy and floppy, but it’s not awful. Ok, not really winter. It was raining (again), which in these parts denotes NOT winter about as strongly as anything. Yay, liquid water! But definitely not as summery as I’d like. Still, I continue to sew hopefully, so today I plugged away with my gauze 70s tunic, trying not to mutter about how much I prefer nice, heavy coating fabrics. 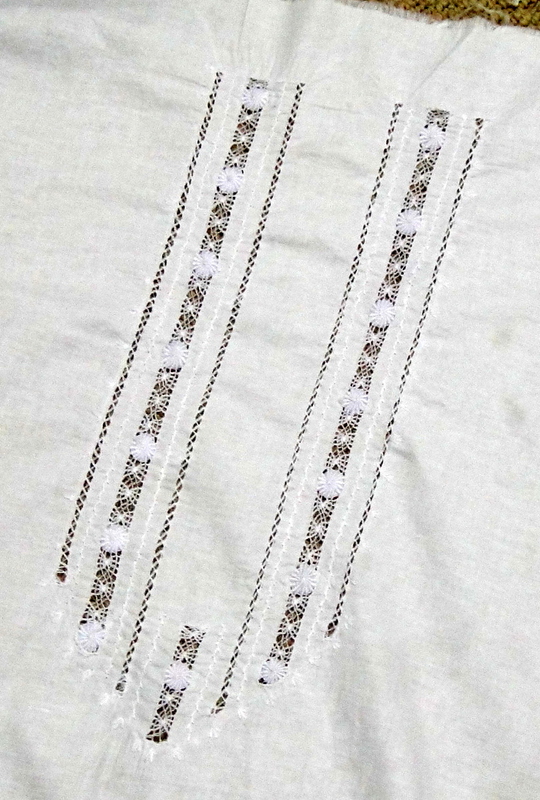 Cotton gauze and voile don’t rate too high on the scale of difficult fabrics, but you have to be so careful about the finishing, especially in white. Things I usually ignore, like how evenly I grade my seam allowances or whether my tail threads are getting eaten by the feed-dogs, stick out like a sore thumb. Now, I was aiming for view C, the left-most on the pattern envelope. Since it was a sleeveless (essentially), un-fitted pattern (and I don’t know how McCall’s patterns fit me yet anyway), I omitted my usual swayback and petiting alterations. 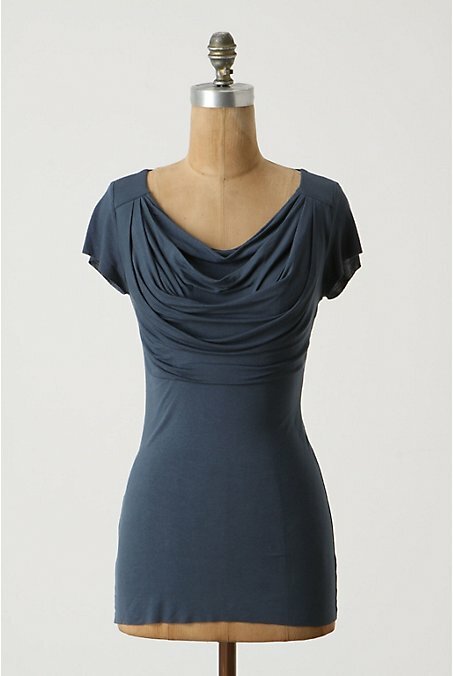 Instead, I opted for a square shoulder alteration, which I’ve been pondering on my last few tops. And I’m quite happy with the results, although I should probably have lowered the neckline the same 1.5 cm I lowered the centre edge of the shoulders. I did that for the back neckline, but didn’t think to do it for the front. If I make this view again (which isn’t certain, as there’s lots of options) I’ll lower the whole neckline at least an inch, anyway. After some consultation with mommy dearest, I did some seam-finishing experimentation and settled on the lazy stitcher’s French seams, which is where you serge the edge on your first pass, then press and encase the serged edge within the French seam for the second pass. Basically it adds the serger thread, but saves you the trimming stage. I pretty much blow at trimming seams evenly, so this let me get a much narrower French seam than otherwise, so despite the extra thread I end up with less bulk. Although my serger, despite being serviced just at Christmas, has tension issues when dealing with light-weight fabrics; there doesn’t seem to be any middle ground between ultra-loose and loopy and too-tight-and-ruffling. I’ve discovered that if I leave extra-long tails I can usually work the thread in so the thing lies evenly afterwards, but it’s a bit of a pain nonetheless. Yes, it’s time for a new serger. One with all the bells and whistles. I was really, really scared of the sweetheart neckline. Mostly because I felt the fabrics were too light to interface or reinforce, other than stay-stitching. So I stay-stitched, and handled as little (and as carefully) as I could. It did wind out a smidge stretched out, but… decent. And mostly symmetrical, my other fear. Although I used the lining as my facing for the neckline, for the armscyes I bound with bias-tape made out of the voile, and pressed to the inside. I used my machine’s lone decorative topstitch (OK, the only one I like) to topstitch around the neck and the armscyes. Patty is making me very jealous with her decorative topstitching. Aside from the shoulder alteration, the only other change I made was to add 13 cm (aka 5 inches, but I’m trying to be a good metric girl these days. The search for a metric gridded ruler continues, and I am consciously teaching my kids to sew in metric. 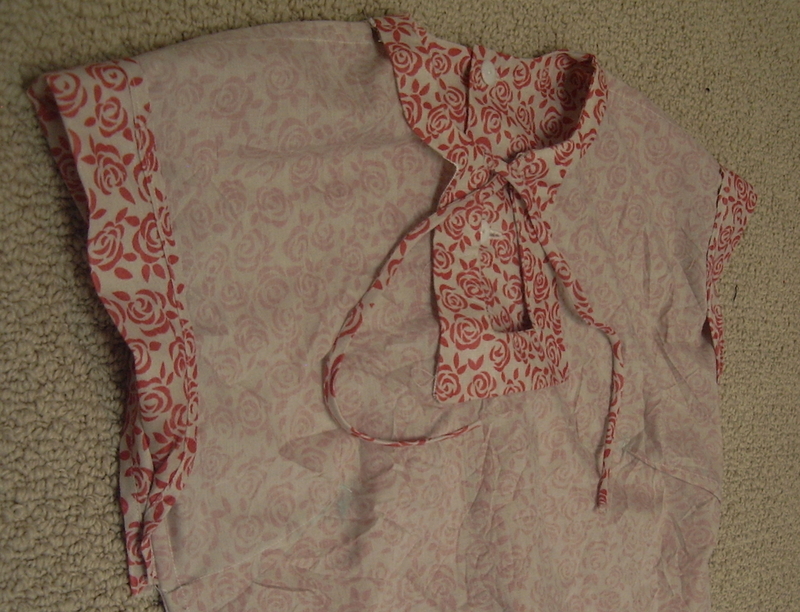 ), to the hem, bringing it from a blouse length to a tunic length. Somehow when I was thinking about this pattern, the outfit I conceived of was this tunic-almost-dress worn over cutoffs you almost can’t see are there. Voila. Although maybe for the full illusion I should’ve made the top a couple of inches longer still. I’m quite satisfied with the fit—none of that bunching up behind my neck that I often get, so I presume the square-shoulder thing did its work. Other than that there’s not much to fit or not fit ;). Side-bust darts might improve the shape a bit, but aren’t actually necessary. View C has a self-sash stitched in place at the centre front, and I even cut one out, but then I couldn’t resist trying it with my Japonesque fabric sash, and I love it, so I’m going to leave it changeable for now. We’ll see how it stays in place when I ever get a chance to actually wear it. But all in all, super happy fun! There’s a bit of the inevitable pregnant pouf that is going to accompany pretty much any take on this style, but this is a look I’m resigned to, as it’s pretty much my natural figure anyway. *I think I should apologize about the amount I whine about the weather. I’m not sure if it’s human nature or a Canadian specialty, or just that I’m a wimp (I am a major weather wimp, especially about the cold). The weather we are getting right now is a kajillion times better than what I was complaining about in, say, March. So really I should STFU.